This morning we were up early as we were checking in to the Polynesian for a couple of nights. We arrived at the poly at 8.15am and checked in, we then jumped on the monorail to the contemporary for breakfast at chef mickeys. This wouldn't have been a first choice for me but we thought DD would enjoy it. 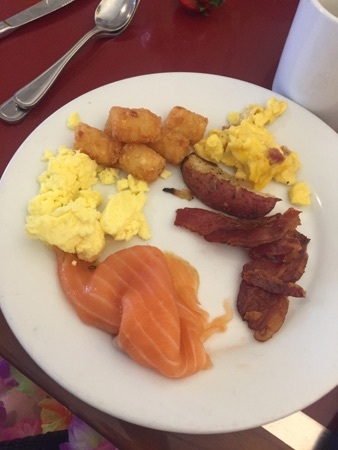 This is my first plate with scrambled egg, smoked salmon, bacon, mini hash browns and breakfast potatoes. 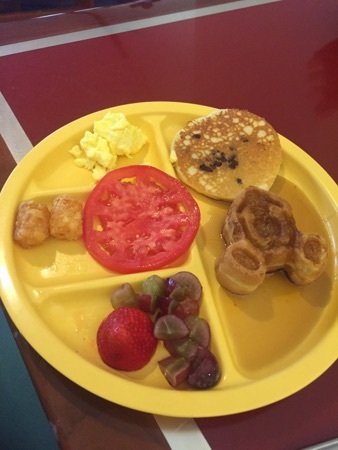 DD had some fruit, scrambled eggs, tomato, hash browns, Mickey waffle and chocolate chip pancake. 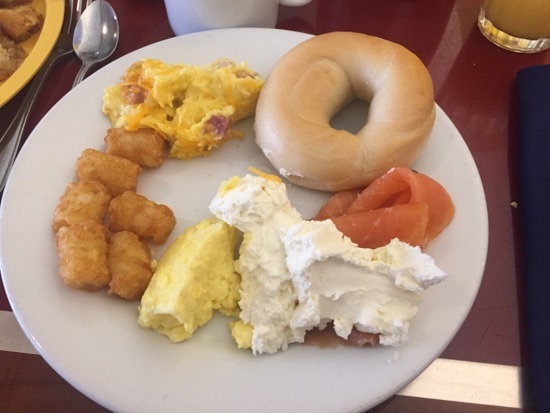 My second plate was similar to my first, we had orange juice and coffee to drink and there was loads of choice on the buffet. They had a large selection of pastries too. I enjoyed the food here but it's not worth the $40 for adults and $24 for children. I wouldn't eat here if I wasn't on the dining plan. 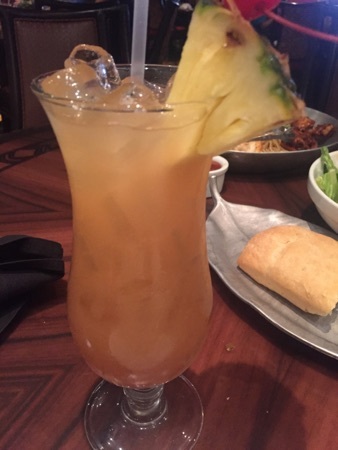 We spent the afternoon at the resort and headed to ohana for dinner. Ohana is a must do for us every trip. This was our 9th visit here. When we arrived we were given our welcome bread, this is a pineapple coconut bread and is pretty tasty. DH and I both had a tropical macaw cocktail, there were $9.75 each. 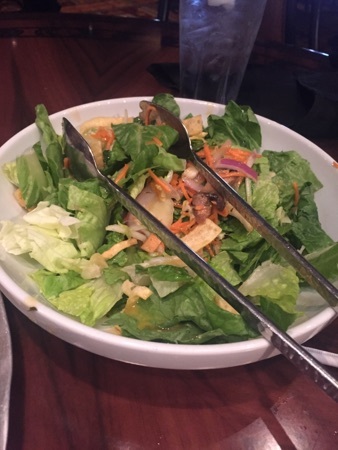 Our server then brought out our salad, this had a passion fruit dressing and was very nice. 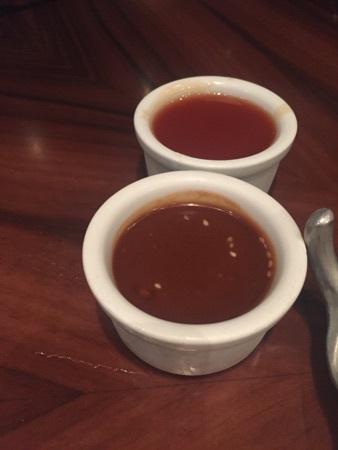 The 2 sauces they give you with the meal are peanut and sweet and sour and go really well with everything. The peanut one is absolutely delicious and my favourite! 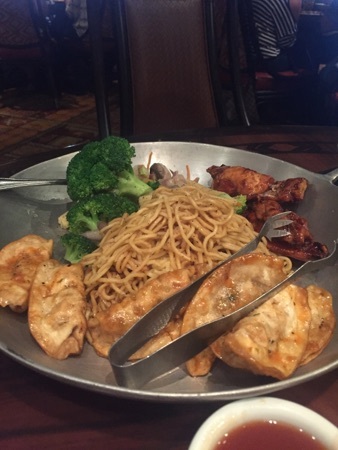 The server then brought out our potstickers, chicken wings, noodles and vegetables. The potstickers and chicken wings are so good and we finished these and were brought a second lot. 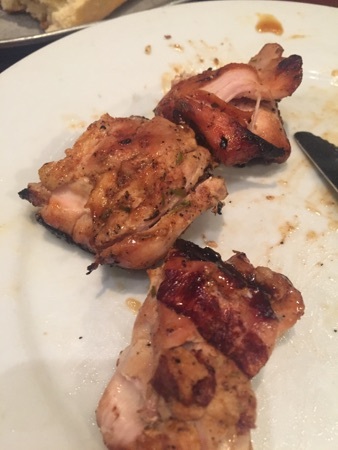 Then came the meat! The chicken was really nice, it went well with the peanut sauce. There was also steak which was cooked perfectly, still pink in the middle. 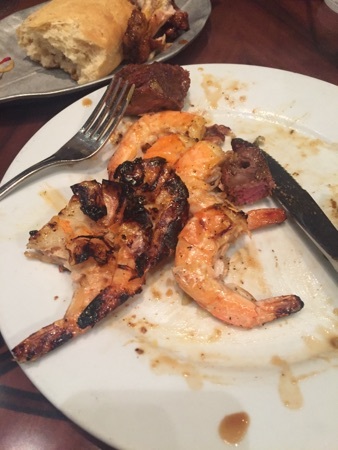 The peel and eat shrimp were ok, I'm not a huge fan of shrimp, I like peeling them but not so much eating them. After all the meats it was time for pudding! This is one of my absolute favourite Disney dishes. Bread pudding served a la mode with banana fosters sauce. It's soooooo good! 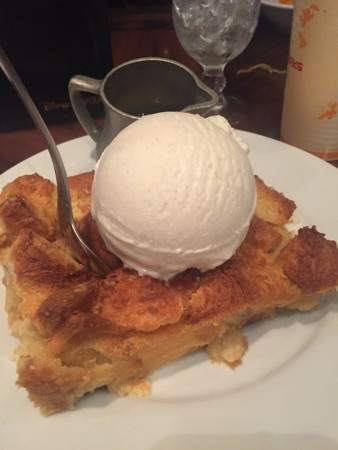 I love the bits of bread pudding which are crunchy on the edges. This piece was huge and we almost finished it. 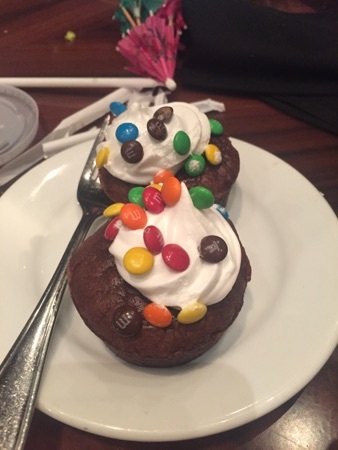 DD was brought 2 chocolate brownies with m&ms. This was $43 for adults and $24 for children. We absolutely love ohana and tonight was no different, it was as good as ever! New Photo Added by missdopey - 18 Apr 17 4:09 AM. Thanks for posting. Looks amazing. I can't wait to try o'hana in November. I am booking breakfast for our first week and dinner for the second week. Cant wait. Enjoy and have a great time. OOooooooo the food at Ohana's looks mouthwatering. Ohana looks delicious, we have it booked for the first time in August, really looking forward to it. Enjoying reading your food report. Food looks lovely today. That all looks very nice. I must try eating in a Disney Resort one day. 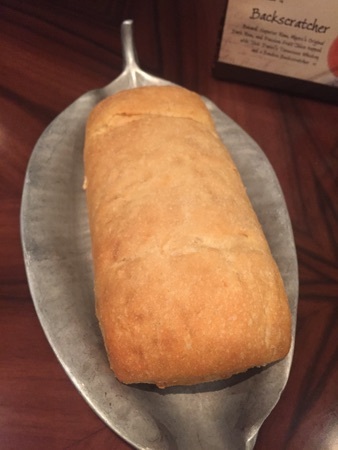 I love the bread at o'hanas  It all looks delicious!